Kerala is endowed with a combination of distinct altitudinal variations resulting from the rise of the land mass from 5 meters below sea level in the west to the soaring heights of 2695 meters in the east within the short span of 120 km. The small expanse of land with an area of 38,863 km2 has a base length of 560 km along the coast and width ranging from 11 km to 124 km. Physiographically, the terrain has three natural regions namely, lowlands, midland, highlands (Figure 1). Geologically, Kerala is occupied by four major rock formations namely, crystalline rocks of Precambrian age, sedimentary rocks of Tertiary confined to Neogene period , laterites capping the crystalline and sedimentary rocks and recent and sub recent sediments forming the low-lying areas and river valleys. There are sporadic Paleozoic granites and pegmatite and Meso-Cenozoic dykes intruding these rocks. The oldest rocks so far dated in Kerala are the charnockites, which yielded an age of 2930 +/- 50 Ma (Soman, 1997& 2002). The varied rock formations under different geological domains harbour different mineral deposits and the transformed rock strata stockpile copious groundwater resource. The state is gifted with ten soil types derived from the laterite base and has 12 distinct agro climatic zones. The undulating topography, vibrant climate and vivacious hydrology in the background of ever active tectonics resulted in 44 river basins, 1750 sub basins and 4452 mini watersheds providing multitudes of lively micro ecosystems. The environment of these micro watersheds are conducive to varying crop types, such as, coconut and rice in the sultry lowlands, rice, tapioca, banana, arecanut, coconut, pepper, cashew and rubber in hot humid midlands and tea, coffee and cardamom in the cool subtropic highlands. The micro ecosystems are such that the valleys with near waterlogged conditions for most part of the year are seen juxtaposed with dry hilltops decked with densely canopied trees. Considering the characteristics of soil, drainage/wetness, erosion, runoff etc., Kerala has 18 land capability subclass associations of five broad land capability (LC) classes (KSLUB, 1995 and 2002). The broad LC classes are Class II (Good cultivable land), Class III (Moderately good cultivable land), Class IV (Fairly good cultivable lands), Class VI (Well suited for forestry or grazing), and Class VIII (Land suited only for wildlife and recreation). The approximate area under each class is given in Figure2. The soil of Kerala has limitations for sustained use under irrigation. Only about 37% of the area of Kerala is suitable for irrigation with certain limitations. Kerala has a diverse land use and cropping pattern. The land reforms introduced in the State brought in radical and comprehensive institutional changes leading to drastic transformation in the land holding pattern. This has resulted in shift in the land use pattern. Agriculture is the dominant land use type of the State. It accounts for over 55% of the geographical area followed by forest land (including degraded forest) of 28% but area under non-agricultural use is only 11% (Farm Guide, 2006).Classification of area under land utilization for the year 2006-2007. The land use pattern of Kerala during 2009-10 reveals that out of a total geographical area of 38.86 lakh ha. net sown area is about 56 percent. Forest occupies around 28 percent. Agriculture and forest sectors together account for over 84 percent of the land area. The net sown area has increased by 4.39 percent while the total cropped area has declined by 0.97 percent. Land under non-agricultural uses was 9 percent in 1999-00 and has increased to 9.68 percent in 2008-09 and it slightly declined to 9.31 percent in 2009-10. There was an increase in the area under current fallow (9186 ha) and a decrease in the area under fallow other than current fallow (581 ha) during 2009-10 over 2008-09. The area under cultivable waste increased by 1821 ha. and barren and uncultivated land declined by 7019 ha. Data on land use pattern of Kerala for the year 2010-11 is given below. Out of a total geographical area of 38.86 lakh ha. net sown area is about 53 percent. Forest occupies around 28 percent. The net sown area has declined slightly by 0.35 percent. The share of total cropped area in the total geographical area is 68 percent. But it marked a decline of 21217 ha during 2010-11 over the previous year. The share of land under non-agricultural uses out of total geographical area was 9 percent in 2009-10 and has increased to 10 percent in 2010-11. There was a decline in the area under current fallow (917 ha) and increase in the area under fallow other than current fallow (6569 ha) during 2010-11 over 2009-10. The area under cultivable waste declined 6349 ha and barren and uncultivated land declined by 2473 ha. The land use pattern in Kerala during 2010-11 is given here. The data on land use pattern of Kerala for the year 2011-12 is given here. Out of a total geographical area of 38.86 lakh ha. net sown area is about 53 percent. The net sown area has declined by 1.5 percent in the current year over 2010-11. The share of total cropped area in the total geographical area is 68 percent. It marked an increase of 14296 ha during 2011-12 over the previous year while the net area sown declined by 31375 ha over the previous year. The share of land under non-agricultural uses out of total geographical area is 10 per cent in 2011-12. There is an increase in the area under current fallow (1028 ha) and increase in the area under fallow other than current fallow (5727 ha) during 2011-12. The area under cultivable waste also increased by 3772 ha and barren and uncultivated land declined by 2021 ha. The land use pattern of Kerala during 2011-12 is given here. Out of a total geographical area of 38.86 lakh ha, one fourth was under forests, and one tenth of it was put to non agricultural use. Also, while the net sown area which accounts for 53 percent of the total area, did not record any significant changes, the area sown more than once which accounted for 14 percent of the total geographical area recorded a notable decline of 13 percent from 6.2 lakh ha to 5.4 lakh ha in 2012-13. As a result, the gross cropped area registered a decline of 3 percent. One notable feature is the decline in the area of barren and uncultivated land and an increase in permanent pastures and grazing land which although accounts for only 0.003 percent of the total geographical area registered a sharp increase of 39 percent in 2012-13. Numerical and graphical representaiton of land use pattern for the year 2012-13 is shown here. The land use pattern in Kerala 2012-13 is given here. The data on land use pattern for the year 2013-14 is given here. Out of a total geographical area of 38.86 lakh ha, little above one fourth was under forests, and one tenth of it was put to non agricultural use. Also, while the net sown area which accounts for 53 percent of the total area, did not record any significant changes, area sown more than once which accounted for 15 percent of the total geographical area recorded a notable increase of 4 percent from 5.4 lakh ha in 2012-13 to 5.65 lakh ha in 2013-14. As a result, contrary to the previous year the gross cropped area registered an increase of 1 percent. Another notable feature is the decline in the area of barren and uncultivated land by 17 percent, of permanent pastures and grazing land by 93 percent and the area under current fallow by 8 percent. The land use pattern in Kerala 2013-14 is shown here. However, if the total area is further regrouped into two major categories: 'land that is available for cultivation' (including net sown area, cultivable waste, current fallow, fallow other than current fallow and land under miscellaneous tree crops) and 'land not available for cultivation' (which includes land put to non-agricultural use, barren and uncultivable land and permanent pastures and other grazing land besides forest area). In that case it can be seen that land that is available for cultivation comes to 57.9 percent of the total geographical area. The current Net Sown Area is 52 percent of the total geographical area. Thus most of the land that is available for cultivation is already under cultivation. Hence the scope of bringing more area under cultivation is marginal and increase in agriculture production can be achieved mainly through increasing the productivity of crops. The total cropped area of the State has been declining consistently, from 30 lakh hectares in 2000 to 25.84 lakh hectare in 2016-17. Net sown area has recorded a slight decline of 8.64 percent, and the area sown more than once has declined by 30.29 percent. Current fallows have decreased 7.5 per cent whereas the "fallows other than current fallows” as well as “cultivable waste land" have recorded an increase of 63.38 per cent and 71 per cent respectively. Thus the land that is available for cultivation but is not being cultivated is on the rise signalling the tendency of people to keep land fallow for various reasons. The state is endowed with a number of occurrence/deposits of minerals such as heavy mineral sands (Ilmenite, Rutile, Zircon, Monazite, Sillimanite), Gold, Iron Ore, Bauxite, Graphite, China clay, Ball clay, Fire clay, Tile and Brick clay, Silica sand, Lignite, Limestone, Lime shell, Dimension stone (granite), Magnesite, Quartz-Steatite etc (Nair et al., 2005; KSLUB, 1995 and 2002). However, mining activities on large scale are confined mainly to a few minerals. 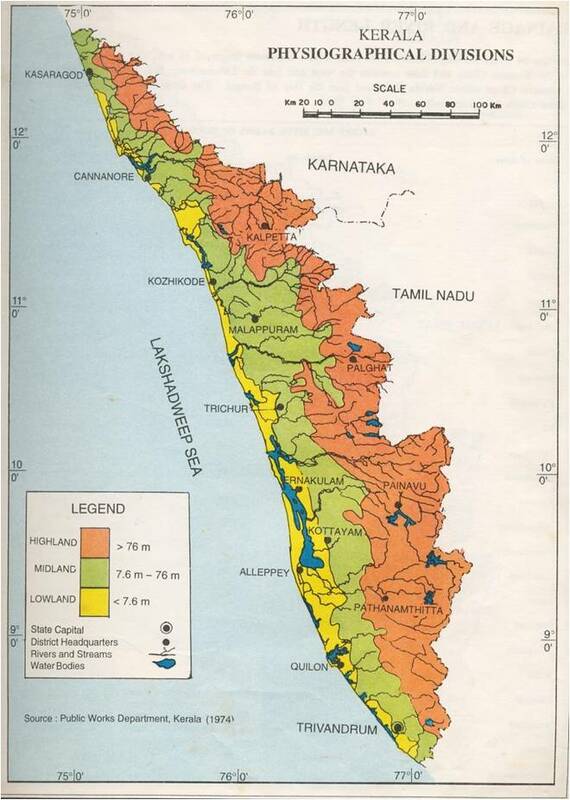 The mineral distribution map of Kerala is given below. The reserves of various minerals and mineral production in Kerala are given below.